After logging into the website, you can search for and view registered assignors who have completed the Assignor Directory. The form is opened from the Main Menu - Assignors - Assignors Directory or from the Member Info page - Member Services - Find Assignors for Games drop-down. The link "Youth Club Assignors" provides a spreadsheet of all the current assignors in the state. The form defaults the Home Area to the District where the you are registered. There are several ways that you may search and display Assignors. The fields may be used singly or in combination to define the search parameters. Click on the headings below to view Help for each search method. When you are finished entering or selecting your search parameters, Click the Search button. The default parameters for searching for Assignors is to display any type of game that is played in your Home Area which is the District in which you are registered. 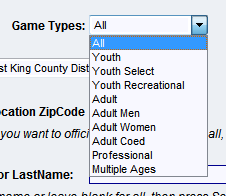 You may search for Assignors who assign specific types of games by selecting from the Game Types Drop-down. You may change the Home area to a District other than your registered District or view All Assignors by selecting 'All' from the drop-down. Be sure to set the "Home Area" to "All" to search the whole state. 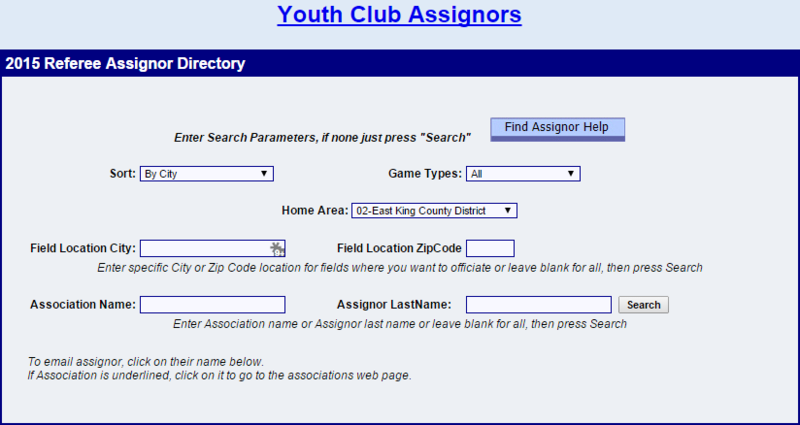 You may search for Assignors that assign games for a specific Referee Association, chapter, League or Club. You may search for Assignors by entering the Assignor's name. 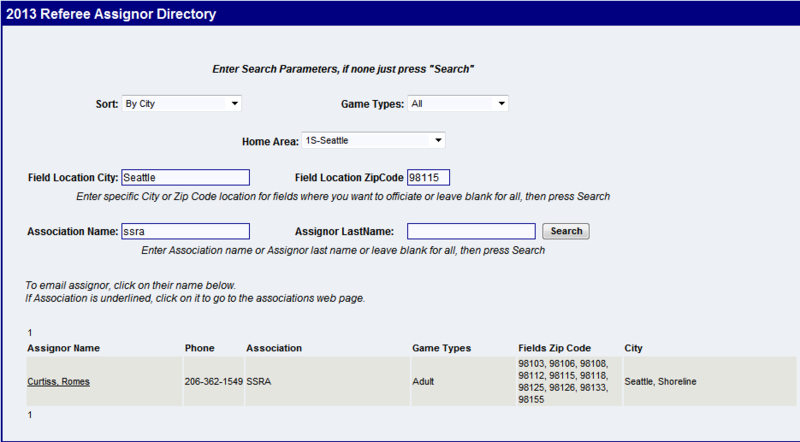 The image displayed below is the result of selecting District 1S from the Home Area drop-down; entering Seattle in the Field Location City field, entering 98115 in the Field Location Zipcode field, and entering SSRA in the Association Name field.